Do you remember waaaay back when I showed you this picture? Well, as previously promised I’m ready to show you the money. Here’s the start to finish of this messy project. Gross right? This house is SO 80’s. And I’m so over the 80’s. 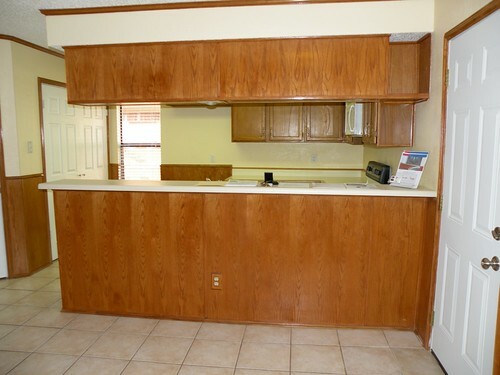 Besides ripping out all that horrible paneling and the brown crown molding (don’t flame! I really do like crown molding!! 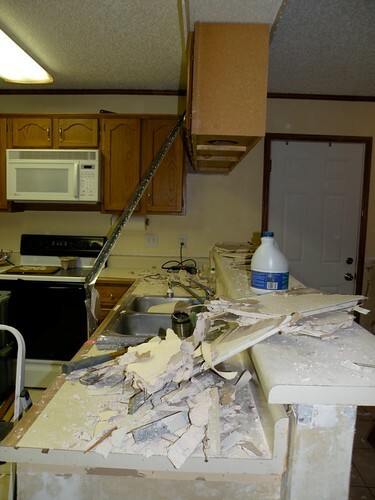 ), I just totally could not stand having cabinets hanging down from above the sink. It blocked my view of the breakfast area and the family room and it made me feel totally isolated from the rest of the family. I decided to just take it down myself. 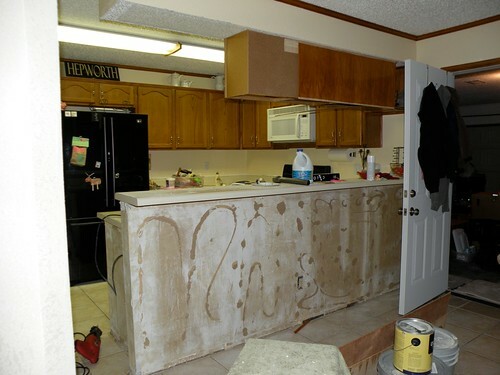 I jumped up on the counter top and began unscrewing the cabinets. I did just fine on the first one, but then on the 2nd and 3rd cabinets the screws were totally stripped out. Ah crap. Now what do I do?? I figured the wall was coming out also so why not just bring it all down at once? I got out my hammer and began whacking. Holy mess! Who would have thought I’d get this much mess from ripping out some drywall? 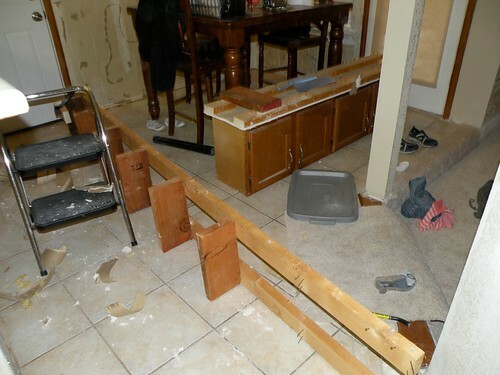 Once I got all the drywall off I got out my trusty crowbar and began to pry those 2x4s apart. Um, okay. Now what? This is when it began to get tricky. Do you realize how much two cabinets and about 5 2x4s worth of wood weighs? I was by myself working on this project and it was super heavy. I didn’t take any pics of it (should have – dang it!) but basically I stacked up several bins and boards until it touched the bottom of the cabinets. That way when the cabinets came down (with my crowbar) the entire unit landed on my makeshift pile instead of me. 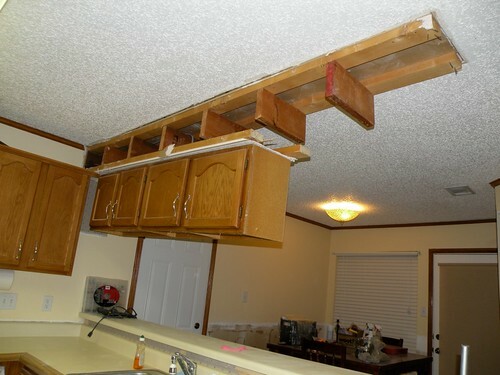 Notice the cabinets are still screwed to the underside of the ceiling? I had to later actually cut the screws off of the cabinets. They did not want to come out! Unfortunately and unbeknown to me this wall built out of the ceiling was built all as one piece and then inserted after the fact. 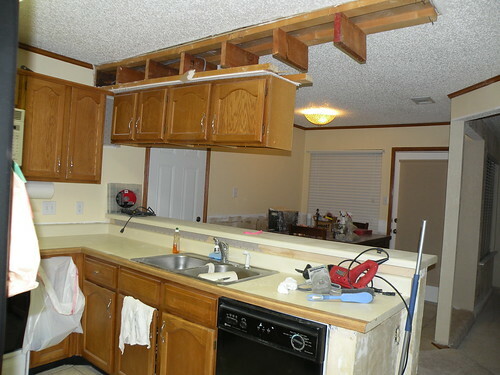 The drywall was actually attached from the top down into the hanging wall (is this making any sense at all?). Basically, when I took out the wall section hanging from the ceiling, all the drywall came with it spilling insulation everywhere! I did not see that coming. Yikes. I very carefully scooped up all the insulation and put it in a garbage sack. Once the project was completed I dumped it back in my attic. I took the section of drywall that was attached to the 2x4s and screwed it up into the studs in the ceiling. It wasn’t the best piece of drywall so I had to patch it a bunch. After I patched up the entire area with spackling it was time to texture it. 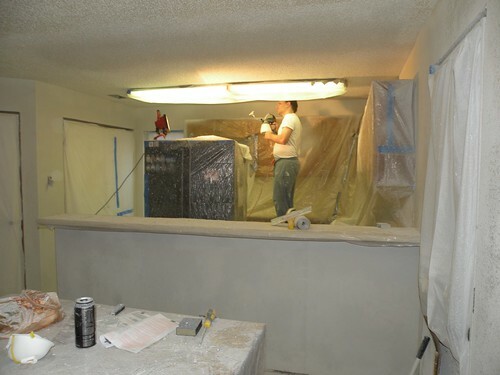 In a move that I would later regret – A LOT – we filled our texture machine with popcorn ceiling stuff so we could match the rest of the ceiling. Spraying popcorn has got to be the worst, nastiest, grossest, messy job I’ve he’s ever done. Disgusting does not even begin to describe how gross you and the entire room get after spraying popcorn. I DO NOT recommend it to anyone unless you absolutely have to. Then we just painted the ceiling (and the rest of the kitchen). 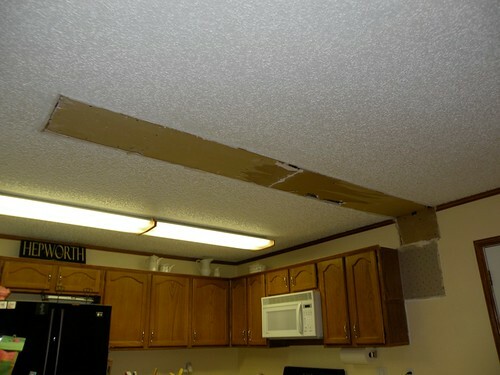 Here’s why I he regrets spraying the popcorn ceiling (besides it being totally nasty stuff). After we finished the kitchen I started on the bedroom makeovers. I quickly learned how EASY it is to scrape popcorn OFF your ceiling and promptly began scraping every ceiling in our entire house. 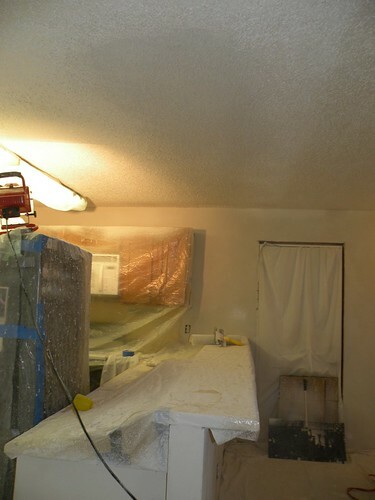 SO basically I wasted my time spraying the kitchen ceiling because in the end we are going to scrape it, and also scraping a painted popcorn ceiling is so much harder than scraping a non-painted popcorn ceiling. Now we really have our work cut out for us. At the end of the day I think this project turned out totally rockin’ fabulous. You can’t even tell there use to be a wall there. I think I did an excellent job on the patch job. The ceiling looks a tad different color in the picture, but IRL it is the same color. I think it’s a weird shadow. Also, did you notice we textured and painted all the walls as well? Since this picture was taken I’ve hung all the baseboards and molding and painted it all bright white. Unfortunately I don’t seem to have any pictures of my work and I can’t take any now b/c I’m currently not living in this house. The main reason I love this so much is because it feels so much more open. I don’t feel like I’m stuck in the kitchen while my family and friends are off in the breakfast area socializing. It makes it feel more like one big open space. Plus now the lighting in the kitchen (horribly ugly, I know) spreads throughout the entire kitchen and breakfast area and into the living room. Now the fun begins… DECORATING!!! Oh wow, that turned out GORGEOUS! I’m sure it was crazy during the whole process, but the results are fantastic, good job! You did a FANTASTIC job!! I’m not sure I would have had the patience for that! Oh my gosh I cannot believe you tackled that by yourself!!!! Nice work!! Oh my gosh!! What a job! Glad it was you and not me!! But it looks fabulous!! Well done!! I can’t believe you did that all yourself! That takes some guts! 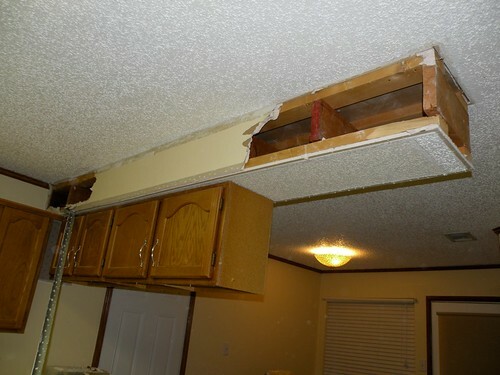 I had to laugh at the popcorn ceiling ordeal because we went through something similar in our old house when we replaced some of the ceiling. The spray was a HUGE mess and we ended up having someone else do the texturing for us (condo association). I’m going to have the same problem in my house house so I need to find someone to do it. TOTALLY worth it to pay someone to match it or just pull it all down. Looks great! Yay! I hate the 80’s too. 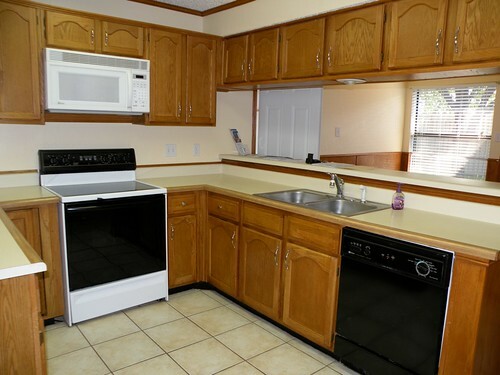 Your kitchen is up to date and looking fresh! 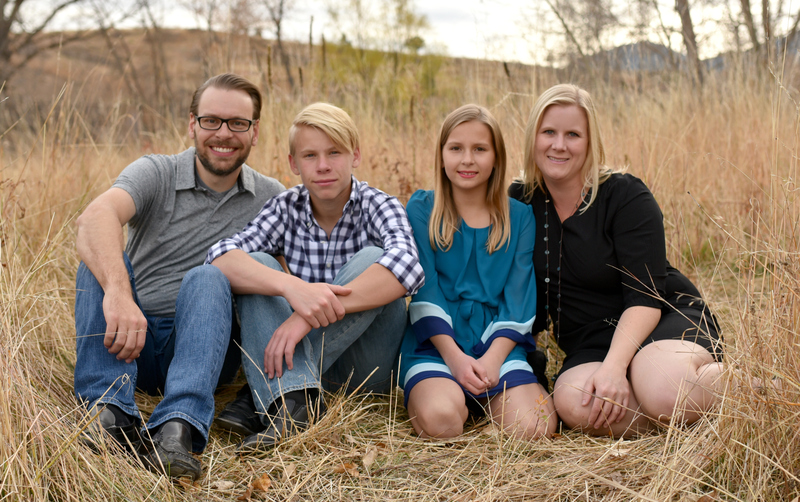 It sounds like your husband is like mine. Mine is nicknamed “The Closer” because he has to come in behind me fairly often and close up or finish up a project. Gotta love em’! Oh my GOSH! After, after, AFTER! Love the after! Looks great! Now we need a tutorial on scraping the popcorn! Looks great! You sound like me when it comes to taking care of things yourself! I’m not very patient when I decide I want something done…I just tackle it myself! I definitely like the After! I did paint my living room once when Husband was gone on a trip. 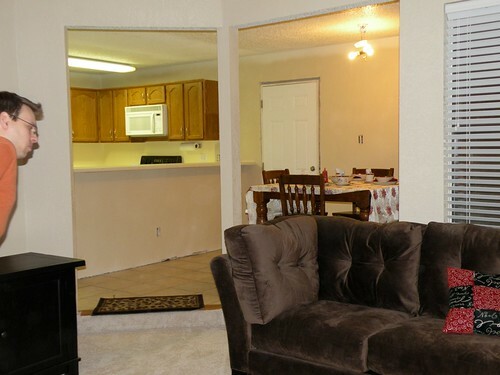 (But we had picked out the color before…) I’m not brave enough for demolition on my own! 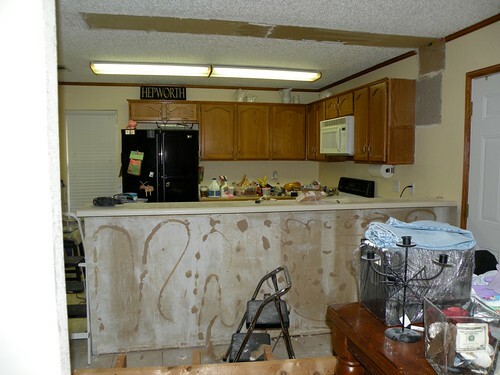 Taking down those cabinets make the kitchen seem a lot more open…but man that was lot of work! Looks SO much better! Painting the back of the bar makes a huge difference. 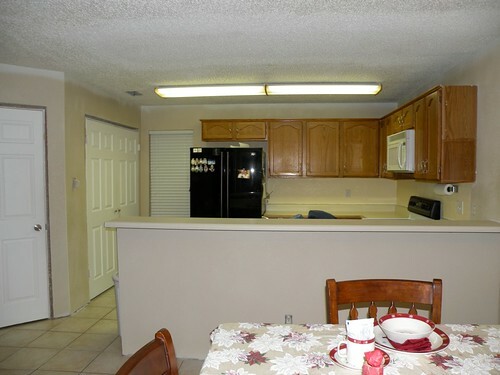 Are you going to paint the cabinets? Hope you will read this. Wonderful work. So much more open, bright and nicer after your hard work. It is so satisfy that you can do it yourself then hiring somebody to do it for you. 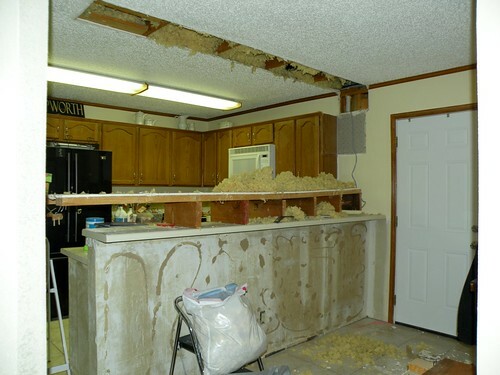 Do you mind telling me how to remove popcorn ceiling. I have a family room 10x 18, ugly, horrible popcorn more like ” spike” ceiling. Had been afraid to touch since I move in my house past 7 years. 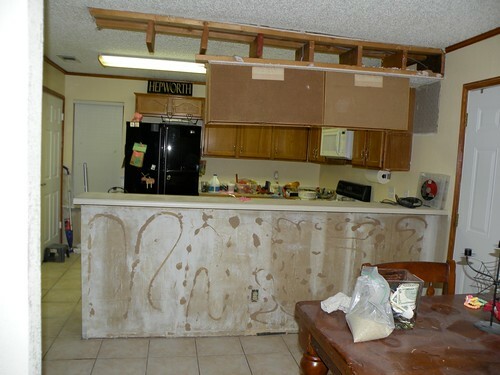 Contractor recommend to put dry wall to cover it due too difficult, messy to remove. You mention you did it. Please teach me. Thanks in advance.